If you're traveling to the Greater Phoenix area in December, you probably won't be surprised to learn that a lot of the events that take place in the city this time of year are centered around holiday celebrations. There are also a number of great community events, cultural and arts festivals, concerts and performances, and local attractions not related to Christmas, Hanukkah, or Winter Solstice. From Christmas holiday lightings to tailgate parties for your favorite Arizona sports team, there's something for everyone to do in Phoenix this December. With the weather in Phoenix remaining above freezing for most of the month of December, the city's streets come alive for festivals and special events throughout the month. Every Monday, rain or shine, you can also take a casual, social yet self-guided three- to five-mile walk around downtown Phoenix for "Meet Me Downtown," which starts at CityScape, Downtown Phoenix on November 19, 2018. On the first Friday of the month, head to the Arts district for Phoenix First Friday where you can visit over 80 art galleries, studios, and spaces, or you could head over to Motorcycles on Main in downtown Mesa, which closes the road to all but motorcycles, music, food, and a beer garden. Alternatively and also on Main Street in downtown Mesa, check out 2nd Friday Night Out, where live music, entertainment, prizes, and specialty crafts are available to guests every second Friday of the month. Every Sunday in December, Downtown Tempe hosts 6th Street Market, where visitors can find original arts and crafts, live music, shopping, and family-friendly fun. The December event will have more than 60 art booths, food trucks, carolers, and Christmas-themed crafts. Phoenix is a city of artists, covered in murals, art installations, and special exhibits throughout the year, but December brings a unique set of events to this Arizona metroplex. Starting out the month, the bi-annual Tempe Festival of the Arts is a full-scale street fair in downtown Tempe held on Mill Avenue from November 30 through December 2, 2018, featuring more than 500 artists' exhibits of woodwork, pottery, jewelry, and paintings as well as live entertainment. 2018 will be a particularly big event as it is the festival's 50th anniversary. Every Thursday in December, you can also check out the Scottsdale ArtWalk in the downtown Scottsdale Art District for a casual evening (between 7-9 p.m.) walking the streets and enjoying fine art for free. On the third Friday of December (and every third Friday year-round), the streets of Historic Downtown Chandler transform into an artist bazaar complete with over 70 artists' booths at the Downtown Chandler Art Walk. Every Saturday in December, downtown Gilbert is also transforming its street into an interactive display of art at the monthly Gilbert Art Walk where local artists set up booths to sell their work at the Water Tower Plaza in Gilbert’s Heritage District. The Phoenix Art Museum offers free admission Wednesdays 3-9 p.m., First Fridays 6-10 p.m., and Second Sundays noon to 5 p.m., which includes special hands-on, educational programming, and entertainment designed to appeal to visitors of all ages. On December 1 and 15, 2018, the Mesa Arts and Culture Festival, MACFest, take over a portion of Downtown Mesa from Main Street to Pepper Place, featuring artists creations, music, and live entertainment perfect for the whole family, or if you miss one of those weekends, downtown Mesa also hosts the Mesa Arts Festival on December 8-9, 2018 at the Mesa Arts Center. On December 7-9, 2018, you can also visit the Margaret T. Hance Park in Phoenix to celebrate local talent at the Phoenix Festival of the Arts, and finally, on December 15, you won't want to miss the Mesa Arts Center's" Spark! After Dark," a free grown-up night out with live art and music, great food, and adult beverages available for purchase. If art isn't really your style, the Greater Phoenix area also offers many great educational events in the fields of science, history, and cultural appreciation including a number of ethnic festivals, cheap museum exhibits, and special events centered around education. On December 7, 2018 , the City of Scottsdale will once again invite participants 8 years old and over to experience the magic of the stars at Astronomy Evenings, a novice-level talk explaining the facts about the solar system followed by observing the moon, planets, and star systems through a Celestron telescope in Pinnacle Peak Park—registration is required to attend. For a bit of history, consider the Sahuaro Ranch Historic Site Tour, where you can learn about the various buildings, barnyard, trees, and groves at this ranch site which is now a public park, and for an education on everything modern culture has to offer, consider checking out the annual LIBCON West, a convention featuring panels on pop culture topics for teens, crafts for teens, vendors selling their comic-con inspired materials for everyone of all ages, food trucks, and cosplayers at the Glendale Main Public Library on December 8. Experience different cultures, too, at either the Indian Market at the Pueblo Grande Museum on December 8-9, 2018 featuring representations of more than 50 tribes displaying and selling their arts and crafts; the Musical Instrument Museum's "Experience Brazil" on December 1-2; or the Arizona Asian Festival at the Scottsdale Civic Center Mall on December 1-2. If you're a fan of music and entertainment (who isn't?!) 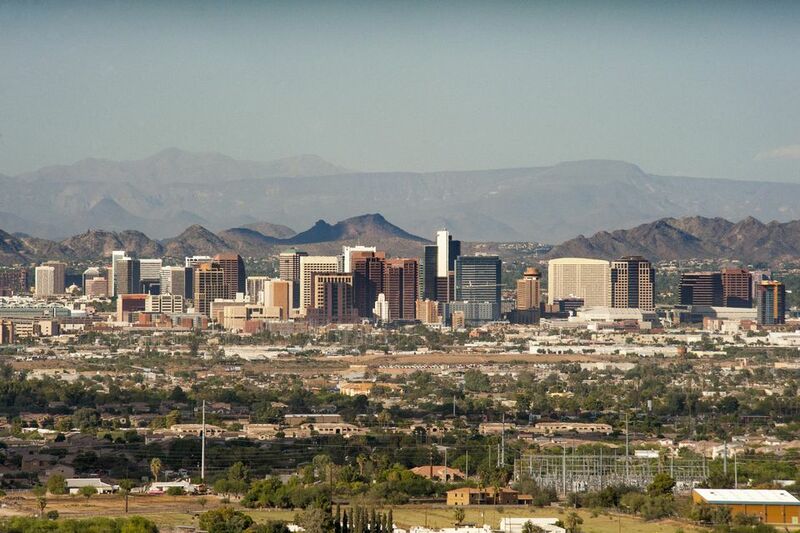 and traveling to the Greater Phoenix area, don't miss out on some of the great concerts, performances, and showcases of talent that this Arizona region offers up to guests. In Chandler, the Sonoran Sunset Series offers families a special holiday concert on December 20, 2018 at the Environmental Education Center, or you can head over to Glendale for the Glendale Community College performances of students and faculty of the school. At the Desert Ridge Marketplace, there are concerts every Friday and Saturday nights at the "Desert Ridge Concert Series," or you can head over to Downtown Gilbert's Heritage District for a concert the Water Tower Plaza (across from Hale Theater). If you're visiting the Mesa Arts Center and have a moment during your lunch hour, be sure to check out the "Out to Lunch" concerts featuring folk, country, jazz, Dixieland, oldies, and world music in the Wells Fargo Garden on select days between November 8 and December 13, 2018 from 12:30 to 1:30 p.m.
Arizona is a land of natural beauty, so it stands to reason that there's plenty of wildlife to see while you're visiting, even in the colder month of December, but did you know there is a world famous Arabian horse farm and an all-breed cat show that both offer special events in December? At the Mesa Convention Center on December 8-9, 2018, the " All Breed Cat Show" returns to Phoenix and features professional exhibitors, vendors, and cat-loving spectators from around the world hosted by the Phoenix Feline Fanciers. If bigger animals are more your style, consider taking the Arabian Horse Farm Tour at one of Scottsdale's prominent Arabian horse farms, which open their doors, welcoming the public to enjoy National Champion horses, meet top trainers, and learn more about this breed from December 28, 2018, through January 1, 2019. Alternatively, head over to the Fairgrounds in Central Phoenix for the annual Arizona National Livestock Show, which takes place December 27, 2018, through January 1, 2019. December is a month full of sports in Arizona, with regular season games happening for the Arizona Cardinals football team, the Arizona Coyotes hockey team, and the Phoenix Suns basketball team as well as several college teams in the area. The Arizona Cardinals play professional football at the University of Phoenix Stadium while the Coyotes play NHL hockey at the Gila River Arena and the Phoenix Suns play NBA games at the Talking Stick Resort Arena. There are also a number of Bowl games and special sports events, including the Pac-12 versus Big-12 Conference matchup game the Cactus Bowl and the top college football game the Fiesta Bowl, which also comes with a Fiesta Bowl Parade and Fiesta Bowl Tailgate Party. Before every home Cardinals football game, you can also join the ​Touchdown Tailgate party at the ​Westgate Entertainment District's WaterDance Plaza. If you don't feel like going out and doing something active like shopping or cheering for sports teams, the Greater Phoenix area also offers a number of opportunities to sit back, relax, and enjoy a movie in a public space free of charge. The Phoenix Art Museum, for instance, offers various dates in December for Movies at the Museum, which is free with standard admission to the museum and offers to seat guests on a first-come, first-served basis. Similarly, the Scottsdale Center for the Performing Arts often screens sneak-previews of new and upcoming indie and foreign films before their theatrical release at "Talk Cinema," which offers guests the chance to engage in moderated conversations hosted by guest speakers. Although there are plenty of pop-up Christmas villages and shops across the Greater Phoenix region, there are also a number of specialty sales happening in the month of December where you can get truly unique Christmas gifts. The Arizona Antique Market, for instance, offers thousands of square feet of indoor browsing through some of the best antiques in the state, right in the heart of Scottsdale, and you can also check out the Sweet Salvage four-day shopping event every third Thursday through Sunday (December 13-16, 2018). Christmas Holiday tree lightings, festivals, and events typically begin in mid-November and continue through the end of December and even into January, and you can find extensive listings of those activities and events in the Greater Phoenix Christmas Holiday Guide or by checking out the Chanukah, Christmas and holiday concerts, shows, and activities. Some highlights include the Desert Botanical Garden Las Noches de las Luminarias, which ignites the whole of the Desert Botanical Gardens in a dazzling display of thousands of luminaries lining the paths on various nights through December. If religion is not really your style but Yuletide traditions are, don't miss celebrating the ancient festival of the Winter Solstice when towns all across Arizona celebrate the longest night of the year with music, poetry, fun, and food. Planning on staying in Phoenix through the New Year? Fortunately for you, there's a great number of special events, parties, and celebrations for kids and adults alike to ring in the new year in true Arizona style. Take a look at the New Years' Eve specific events if you plan to stay in the Greater Phoenix area for the last night of 2018.